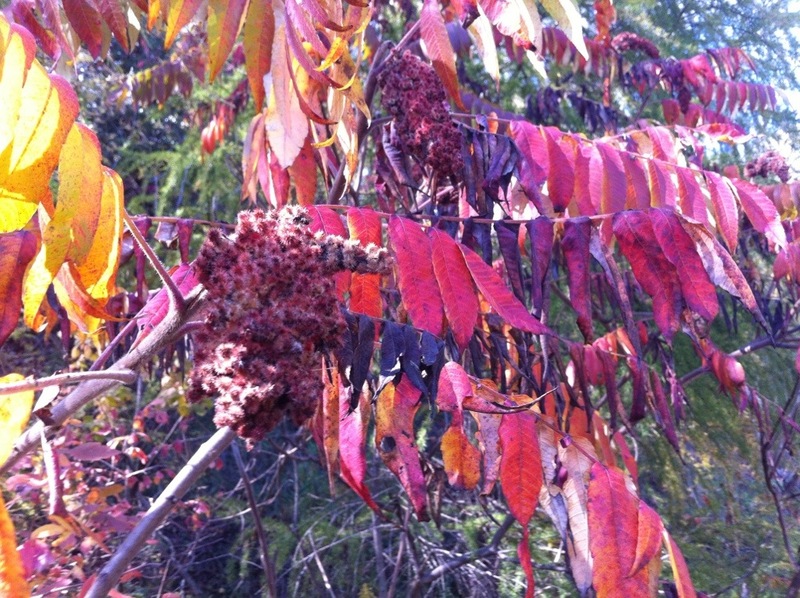 Which means I want to get into the kitchen and stock up for Winter! I’ve been experimenting with all kinds of new-to-me things this month because of Vegan MoFo and one of them is Vegan Cheese! 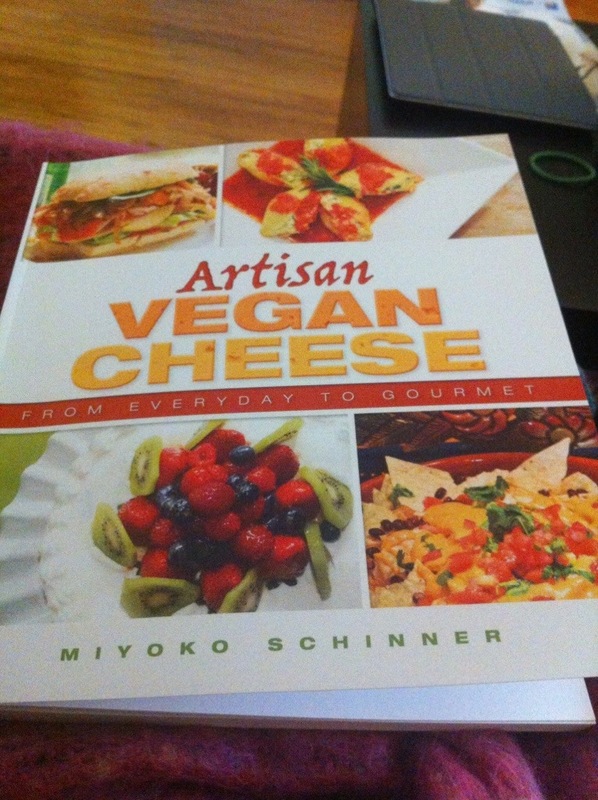 The vegan blogosphere has been a-buzz with reviews of Miyoko Schinner’s Artisan Vegan Cheese, and I knew I needed my own copy. Miyoko’s done a fantastic job of explaining the vegan cheesemaking process, working from the techniques raw foodists have been using for years to make raw cashew cheeses, and developing them with traditional cheesemaking techniques like culturing to make tasty cheeses. In order to make some of the vegan cheeses in the book, you need a culturing agent — and rejuvelac is a great one. It’s a fermented drink made from sprouted grains, and is quite easy to make on your own. All you need is a little time. Miyoko’s recipe calls for any whole grain that you can sprout — I chose one of the gluten-free grains she suggested: brown rice. I was thinking of using quinoa, but it’s a little more expensive (and you discard the grains at the end of the process), so I went into my rice stash. As your rejuvelac is fermenting, you want to keep it covered with cheesecloth, and in a warm spot that’s not right in the sun. Once you’re done fermenting your rejuvelac, you can pop it into covered jars in the fridge for up to 4 weeks. It will totally freak out the omnivore fiances and house guests in your house… and telling them that you’re using it to make vegan cheese doesn’t seem to help. Trust me, it’s totally worth it — at the end of it all, you’re going to have awesome vegan cheese! Begin by soaking the grains: Place your grains into a mason jar, and cover with water. Cover with cheesecloth and a rubber band, and soak for 8-12 hours. 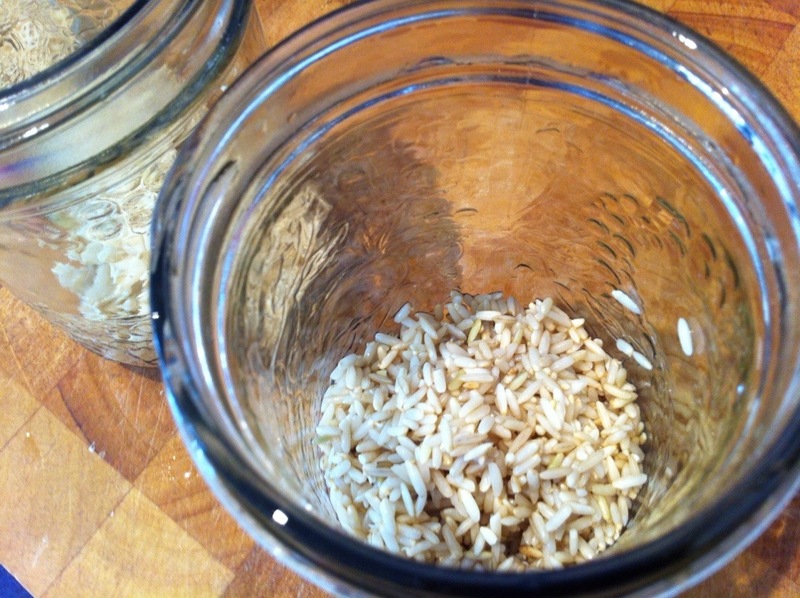 Now sprout the grains: Drain the rice, and place the jar in a warm & dark place. Rinse the grains twice a day, making sure you rinse well so they don’t go moldy. It will take a few days for your rice to get the teeny tails — keep rinsing until they do. 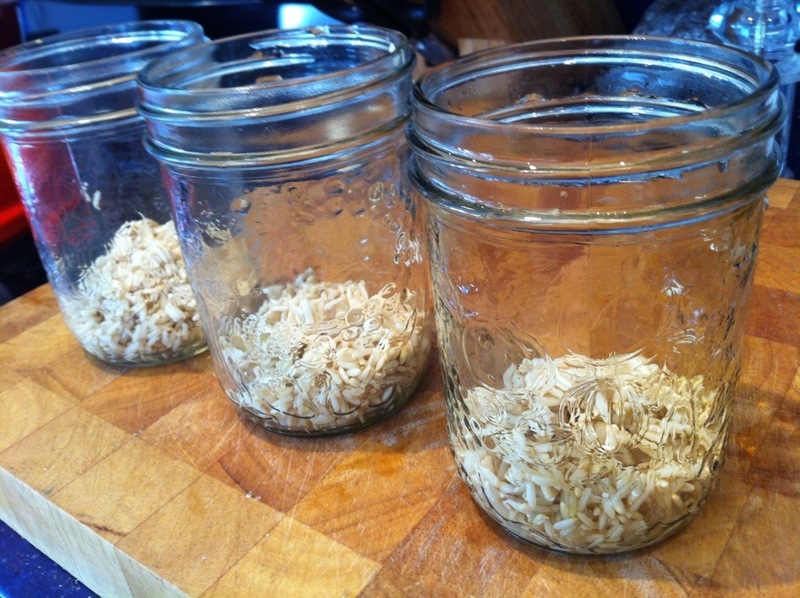 Now ferment your rejuvelac: Divide the grains between 3 mason jars (500 ml each), and top with filtered water. Cover each jar with cheesecloth and a rubber band, and put in a warm spot out of the direct sun for 1-3 days. You’re looking for the mixture to turn a bit cloudy, and the liquid will have a tart lemony taste. The taste will be “cleaner” than the smell (a bit “fermented”). Strain the liquid into clean jars, and cover and store in the fridge for up to 4 weeks. Discard the grains. I think all of the cheese recipes can be gluten-free, but some of them use other ingredients like xanthan gum and carrageenan, which while gluten-free can cause digestive sensitivities. There are some recipes in the back where you can do a lot of gluten-free substitutions. I’d say it’s worth picking up. Hey Daniel — I don’t know. Where would the cobalt come from? 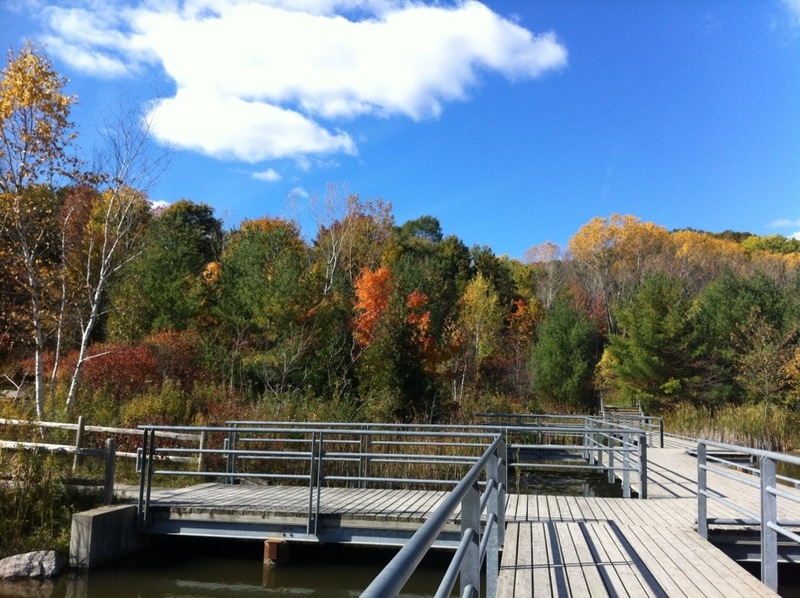 The water supply? It worked! I used long grain rice and I got tails. Thank you for the great post. My brown rice rejuvelac is on it’s way. How will I know that it’s done fermenting? I live in a very warm area (the Jordan valley). Ps. Let me know how your cheese turns out!!! Thanks for the info!!! Today I started my 3rd attempt at making rejuvelac. First I tried with brown rice and then with quinoa, now brown rice again. Unfortunately, first time, rice didnt sprout after longer than 3 days. Quinoa didnt all sprout, only a few of them and then started smelling cheesy. Why could this have been, that not all of them didnt sprout? Old thread but I thought I’d try a question. I tried this recipe this week. My rice sprouted beautifully, and bubbled away merrily in its jar this week. So I thought it was doing well… The liquid is nice and cloudy. I poured out off and it tastes like… Almost nothing. There is a tiny hint of lemony tartness, but mostly just a rice milk-like blandness. I’m trying again but will brew for a longer period. Is rejuvelac a malolactic fermentation or a different process? Like can I just add a drop of my sauerkraut juice to kickstart it?